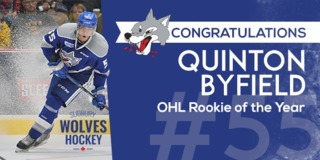 The Sudbury Wolves are woven into the fabric of our community. They’re on our minds, they’re in our hearts, and they’re even in the songs we sing. 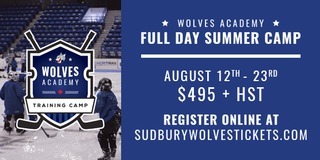 Local musician, Andy Lowe, who has been performing in Sudbury for more than three decades, always wanted to write a song about the Wolves. In 1999, when putting together an album about the people, places, and events that have shaped Sudbury, he immediately thought of the hockey team. 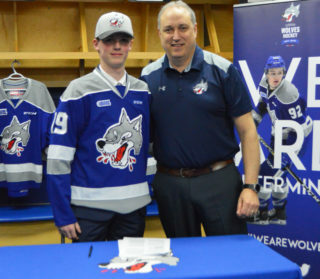 “One of the things amongst all the others that I thought deserved to be sung about was the Sudbury Wolves,” Lowe recently reflected in an interview with the Sudbury Wolves. “They needed to be sung about because they’re basically warriors. They’re all exceptional, and they’re all – in my opinion, whether the team wins or loses the season – heroes,” he added. Lowe had inspiration, but writing about the Wolves wasn’t as simple as picking up the guitar and putting pen to sheet music. In order to create a song that resonated with the fans, Lowe knew it couldn’t be a work of fiction, it had to be something derived from a monumental matchup. So, before working on any of the chords, he headed to the library to do some research. “One thing I try to do when I write my songs, I try and be as authentic and genuine and truthful as I can be so that people can relate to that,” Lowe explained. After going through newspaper articles from the 1975-76 season, in which coach Jerry Toppazzini guided the Wolves to a sterling 47-11-8 finish, Lowe found the moment that would serve as the backdrop for his ballad “Go Wolves Go.” On February 24, 1976, the Wolves hosted the Ottawa 67’s for a pivotal match-up. 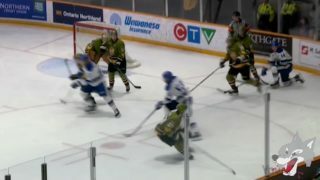 At that time, the Wolves were atop the standings, but the 67’s were nipping at their heels, riding a seven-game winning streak. It was a comeback for the ages. Despite falling behind early in the game, the team never relented. Following the contest, coach Toppazzini praised his squad’s efforts. “That was the big thing…just no letup even though things weren’t going well,” he told reporters. It proved to be one of the marquee highlights from a season that included 47 victories, 72 goals from Rod Schutt, a Leyden Division banner, and a playoff run that ended just three wins shy of capturing the OHA championship. From the opening chord progression to the guitar solo to the infectious chorus, “Go Wolves Go” captures the dogged nature of the team and the community it represents. Forty-two years have passed since that memorable game, but Lowe doubts you could find a better match-up to serve as the inspiration for a song. “I don’t think you’ll go through the archives and find a better song to write about. I just don’t think you could,” he reflected. Some have actually asked him why he hasn’t written about other iterations of the Wolves, but it would be difficult to top that particular game and the era it represented. “You can keep writing songs about the team, it doesn’t matter which team you write about, they’re all great, but this was a legendary team, coached by a legendary man, in a legendary time,” Lowe dared. Today, it’s still one of Lowe’s most popular songs. He still gets requests to play it, and that’s noteworthy because he says he doesn’t receive requests very often. Patrons will ask for the tune when he’s playing at usual venues, but he gets the greatest joy from playing it for students at Sudbury’s annual Heritage Fair. “I always play it there and whenever I say ‘Go, wolves, go,’ the kids all shout ‘Go!’ They love doing that,” he recalled fondly. 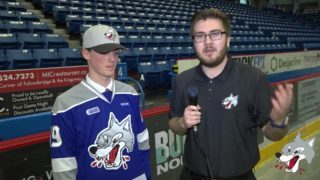 Lowe doesn’t have the opportunity to follow hockey that much these days, but the Wolves still have a special place in his heart. “I think everybody should be proud of the Wolves and I really don’t like these people who are down on the Wolves when they’re losing or when they have a poor season. 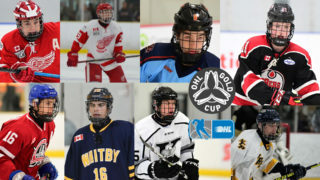 They still need our support and they still need to be recognized as exceptional athletes and as exceptional young men who are really working hard to win some games for this city,” he said.